Cold laser therapy, also known as low-level laser therapy (LLLT), is our clinic’s newest treatment option. The laser works through the application of low levels of visible and near infra-red light to a chosen area. This can cause decreased pain, swelling, inflammation, an accelerated healing process for wounds, deep soft tissues and nerves all on a cellular level. Additionally, a recent study by Harvard Medical School found that in certain doses and when applied to the correct area of the body, LLLT can even have an analgesic effect – drug free pain relief! During the treatment you can expect to feel the laser heads against your skin and maybe a little warmth but it is completely painless. Most of the time, one treatment will take about 10-20 minutes but this will depend on the size of the area to be treated. As with any form of treatment it may take a number of treatments for results to be seen. However, for injuries that you want to heal fast, or for chronic pain for which you have tried everything else, this is a great evidence-based treatment option. Our laser can assist in the reduction of swelling as well as promote healing of many of the tissues related to the injury. We can use it to decrease inflammation caused by arthritis. 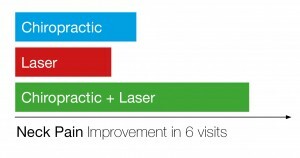 We can use our laser to help people who have been suffering from chronic pain. As well as more recently sustained injuries. Lots of research into the benefit of cold laser therapy for wound healing is available. Particularly difficult to heal wounds including those related diabetes. A recent study was published demonstrating the combined effectiveness of LLLT with chiropractic care for cervical facet dysfunction (neck pain). This showed that although both treatments were significantly effective alone, when used in combination, the results showed the most benefit. More and more research into the effectiveness and safety of LLLT is continuing to be produced. If you’re interested in cold laser therapy come and talk to us and we will discuss whether LLLT may an appropriate course of treatment for you. 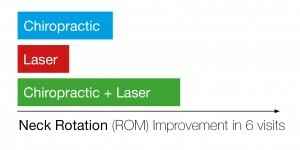 Chiropractic manipulative therapy and low-level laser therapy in the management of cervical facet dysfunction: a randomized controlled study. – Saayman L1, Hay C, Abrahamse H.